What Is Dr. Andrew Weil Origins Advanced Face Serum? This product is being managed under the Estée Lauder brand, Origins. Founded in 1990, the brand has come to be known for its naturally derived ingredients tand for creating so-called “cleaner” choices in personal care. In one line of products, Origins collaborated with Dr. Andrew Weil to formulate products that are founded on the skin rejuvenating properties of mega mushroom. This product works by relieving your skin of irritations, restoring your skin’s optimal nourishment levels, and better protecting your skin from future signs of damage and aging. What Are The Ingredients In Dr. Andrew Weil Origins Advanced Face Serum? Vitamin E: A potent antioxidant that can do wonders for the skin. Vitamin C helps in reducing skin inflammation and pigmentation. It also stimulates collagen production, protects the skin against free radical damage and tones the skin to lessen wrinkles. However, it causes Redness to the skin. This product does not contain parabens, chemicals that can cause hormonal fluctuations likely to lead to lifelong diseases. This product has been guaranteed by the manufacturer to be safe for use by people with sensitive skin types. This product has been specially formulated to deliver a soothing and calming effect on chronically irritated skin. Despite tall claims about the mega mushrooms in this formula, there is limited evidence pointing to any beneficial impacts your skin can derive from these fungi. This product is significantly more expensive than most other products that perform the same functions. Dr. Andrew Weil for Origins Mega-Mushroom Skin Relief Advanced Face Serum reviews includes one posted by a skin care specialist that stressed how several components of this product cause your skin more harm than good. Dr. Andrew Weil for Origins Mega-Mushroom Skin Relief Advanced Face Serum must be applied on your skin, morning and night. 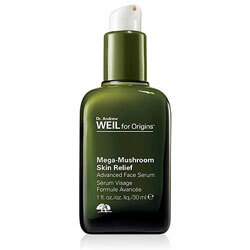 Does Dr. Andrew Weil For Origins Mega-Mushroom Skin Relief Advanced Face Serum have any Side Effects? Dr. Andrew Weil for Origins Mega-Mushroom Skin Relief Advanced Face Serum is an attention grabber for adding exotic ingredients not commonly used in skin care products. Beyond curiosity, however, your senses should already be telling you how this product is an irony when viewed from any angle — promising salvation for chronically irritated skin yet, being itself laden with sensitizing ingredients. Nuvega Lash Revitalisation Serum Review: Ingredients, Side Effects, Detailed Review And More. Bobbi Brown Intensive Skin Serum Review: Ingredients, Side Effects, Customer Reviews And More. Skinception – Rosacea Treatment Review: Ingredients, Side Effects, Customer Reviews And More.